It has been a while since I last wrote on this blog. I was down with a serious case of eczema (Atopic dermatitis)  for the last three months. My both hands were flaking, swelling, blistering, and occasionally oozing – I could barely recognize my bloated hands at times. I also had random rashes and itchiness on my body, neck, arms and legs at different spots over time. The itchiness usually got worse at night. At its peak, my sleep was disturbed almost every two hours during the night due to unbearable itchiness – it was a nightmare! Physically, my condition was fluctuating. Some days, my hands’ condition seems to stabilize and improving – itchiness was gone, swelling subsided and scars peeled with fresh new skin visible – everything seems so promising until suddenly the affected areas started to ooze again – and the whole ordeal began anew! You can image the emotional roller-costal that I was undergoing – interchanging between hope and fear! I am glad that the hard time is over now. My hands have healed and all the rashes and itchiness are all gone! Eczema is a long time condition. I was told by some friends that I was lucky to be able to recover completely within a few months time. There are others who had to suffer from eczema for years. For me, I did not stumble upon some magical remedy that cures me overnight. In fact, it was a gradual healing process for me. During this period I tried out many healing modalities, including Traditional Chinese Medicine (TCM), conventional Western medicine, and complementary remedies such as essential oils, flower essences, energy healing, negative ions and infrared sleeping system, detoxification, nutrition supplementations, etc. I believe in holistic and multi-modality approach towards managing my own condition is the key to my healing. I wish to share this with everyone. What Triggered Eczema in My Case? My eczema was triggered during a period of emotional stress. It was in early August when my mother-in-law passed away and I was in Penang attending to her funeral. Poor diet and lack of sleep might have lowered my immune system considerably. It started as just a few insignificant blisters on my right ring finger. However, it flared up after I came back from the burial site following the burial ceremony, most probably due to bacterial infection. Overnight, nasty rashes covered my neck and my fingers were oozing with blisters. That was the beginning of my three month ordeal. I opted for TCM treatment at first. The herbal remedies prescribed by the TCM doctor seemed to work well to reduce the inflammatory on my neck and hands initially; just as I was confident that my condition was under control, suddenly all hell let loose again and my hands were oozing and bloating with unbearable itches. Reluctantly, I went to see a skin specialist and he diagnosed me with a severe case “infected dermatitis”. I was prescribed with antibiotics (brand name Augmentin) to treat the bacterial infections, corticosteroid (mometasone furoate, brand name Elomet) to apply topically for the inflammation of the skin, and non-soap body wash for sensitive skin (Cetaphile) for my daily washing usage. The skin specialist assured me that my condition would improve in a matter of days and he was confident that such skin disorder can be cured; “99% of the time”, he said. True enough, my hand started to heal almost immediately after applying the corticosteroid cream. Within a week, my hands became normal again with soft new skin but unnaturally redness was still visible beneath. Unfortunately, the optimism was short lived. I developed allergies to the antibiotics. The nerves below my ears became swollen. I had to stop taking the antibiotics. Also, once I stopped applying the corticosteroid cream, within a few days my hands started to ooze again! 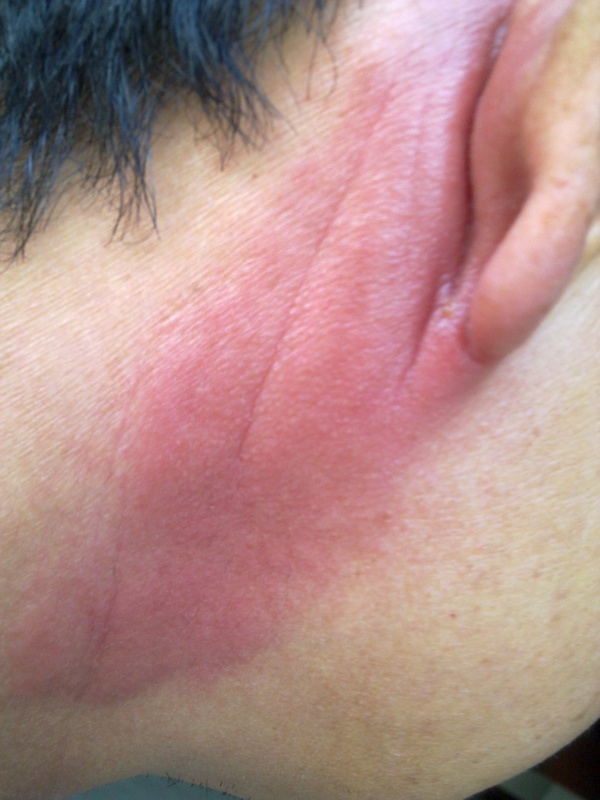 Clearly, the corticosteroid cream was effective in reducing the inflammation to allow the skin to repair. However, it did not cure the underlying cause of the illness. It simply masked the symptoms! It was at this point that I started to search online to look for ways to manage my skin conditions. My reading led me to understand the underlying cause of the illness. From the Naturopathic point of view, the cause of eczema is due to imbalance in the body, especially the digestive function, couple with accumulation of toxins in the blood and an over acidic body environment  . TCM also shares such similar view – the disease is called湿毒 in Chinese, i.e. “Wet poison” literally. I underwent a live blood analysis  and confirmed that my blood was too acidic and contain a lot of toxins. This was a total surprise to me. Another live blood analysis I took less than a year ago had shown that my red blood cell sample was perfectly normal with no clear sign of any toxins. I had been eating very healthily and avoiding chemical toxins in my daily environment as much as possible. “Where did all the toxins come from?” I puzzled initially, until I read this article: “Weight Loss May Push Toxins Into Bloodstream” . Aha! I lost over 13kg over a year’s time since I changed my diet (see my previous post “How do we manage to lose weight?”). I guessed all the toxins that I cumulated in my fat cells over the years had been released into my bloodstream. Apparently, I was not able to clear the toxins fast enough, and it was like a land mine waiting to explode! After the fifth day – I return to my normal diet (whole food, plant-based diet, of course) and started taking Chlorella, a micro-algae substance which has natural detoxification abilities, to eliminate unwanted metals and toxin from my body . In addition, Chlorella, a super food, also provided me with all the necessary amino acids and Vitamins, especially A, D, and B12, that were necessary for skin regeneration. I also took JuvaPower®, a proprietary blend of natural liver-supporting, nutrient-rich foods developed by Gary Young ND of Young Living (YL). It helped to optimize the liver function so that the liver could eliminate toxins and heavy metals out of the body effectively . To support the cleansing at both physical and emotional level, I also found the Purifying Essence from the Australian Bush Flower Essence helpful . It helped to cleanse off emotional waste and provided me a sense of relief after having to deal with the ups and downs of the healing process. In addition, I took AlkaLime®, another Young Living product, consisting of alkaline mineral complex (Sodium, Calcium, Magnesium, Potassium, and essential oils) formulated to neutralize acidity and to maintain desirable pH levels in the body. To boost up my immune system during this period, I took another YL supplement, Inner Defense®, consisted of Thieves® essential oil blend in a capsule. It helped me to improve my immune system. Essentially, it worked like antibiotics for me. From the natural healing perspective, the best way to keep a healthy and strong immune system is to be close to the nature – getting fresh air and plenty of sunshine. The negative ions in the nature promote health . However, due to my skin condition, I had to stay indoors most of the time to avoid contact with dirt and airborne bacteria. This had severely restricted my exposure to the nature and its healing effect. Luckily, I found Energia Sleeping System from REV22 . Within the pillow and comforter of this sleeping system are tourmaline-charged fibers that emit far infrared rays (FIR), alpha waves, and negative ions. Sleeping within this system, I could feel heat generating within the body, a sign of enhanced blood circulation. For the first few nights, I had to wake up almost every two hours throughout the night with my body covered with sweat. The system helped me to sweat out the toxins in my body in the similar way like exercising in the nature. It intensified the detoxification process during my sleep and sped up the healing process of the skin. Even though my sleep was disturbed frequently throughout the night, I found that I was able to get into a deeper sleep each time I got back to sleep. Therefore, I was able to wake up feeling fresh the next day. The sweating stopped after a few days and thereafter I was able to sleep soundly throughout the night, with the sleeping system continued to help me to boost up my immune system. It took time for the body to heal naturally. With all the effort putting into detoxification, balancing body pH level, and boosting the immune system, I was still experiencing rashes on the body and inflammation of the hands. However, I knew that I was on the right way to heal because the severity had reduced. I found the Elomet corticosteroid cream prescribed by the skin specialist extremely effective in reducing inflammation of the skin. However, it wasn’t suitable for prolonged and frequent usage due to potential side-effect of suppressing pituitary-adrenal function . Therefore, I opted to apply the Elomet corticosteroid cream sparingly and only on severe rashes and inflammation. I applied Aloe Vera Gelly (Brand Lily of the desert, available from Nature’s Farm)  on all affected areas of my skin. This natural substance helped to reduce rashes and irritation. It also moisturized the skin to prevent dryness. I took a capsule of YL Lavender Essential Oil (5 drops) many times a day to reduce the itchiness and relief of skin allergies. I also spray the Green Essence and She Oak (Australian Bush Flower Essences) on my affected areas to treat the eczema symptoms and accelerate skin recovery . Over time, the need to relieve my eczema symptoms diminished – all the rashes subsided and my hands and skin returned to normal. Therefore, besides simply managing the symptoms, I believe detoxification and cleanse, balancing the body pH level, and boosting the immune system; are all necessary for the healing of my eczema. I must admit that, in addition to physical healing, during this period, I also underwent several spiritual healing processes to help me to clear off many blockages and assisted in my healing process. Those are beyond the scope of this writing and I will share them in time to come. Hi.. What kind of live blood analysis that you did? is it a blood test? Live blood analysis is the use of high-resolution dark field microscopy to observe live blood cells. It is not a blood test. The process involves taking a drop of blood from the finger tip and immediately view it under the microscope. You will be able to see the shapes and sizes of the blood cells etc. 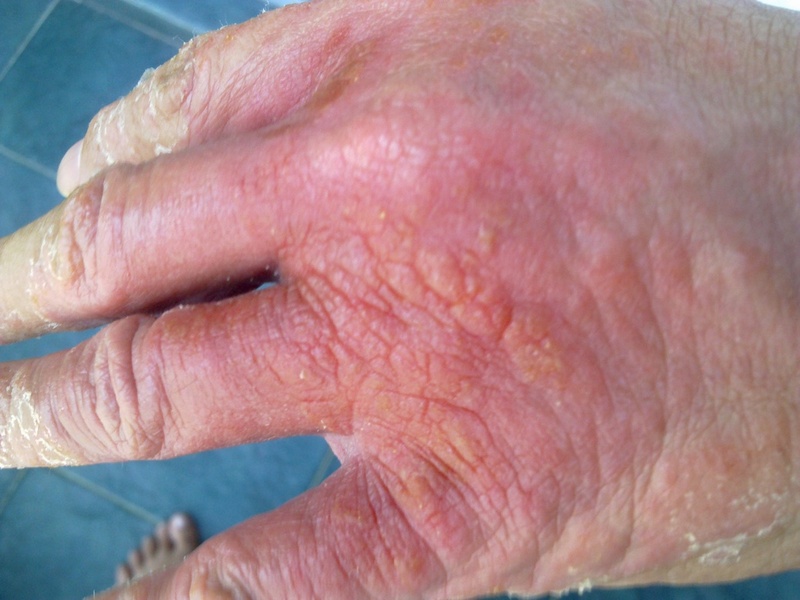 Eczema is an overreaction of the immune system and immune system can react to almost anything. That’s why it is very hard to pin point the source of the allergen. Many people do react to essential oils especially when applying the oils neat without dilusion. Also, over exposure can also trigger the immune reaction. Personally, I no longer apply essential oils neat and only use it with carrier oil and very infrequently. It may be helpful to your condition.